Cook spaghetti according to package directions and drain. Mix hot spaghetti with butter, Parmesan cheese and eggs. Press into a pie pan lightly sprayed with cooking spray. Heat oil in a large pot or skillet over medium high heat. Add onion, pepper, and garlic and cook until softened, about 5 more minutes. Add tomatoes, tomato paste, wine, oregano, salt and sugar. Let simmer over medium heat about 10 minutes for flavors to blend. It will be a bit thicker than traditional spaghetti sauce. Pour sauce over pasta crust and cover with mozzarella cheese. 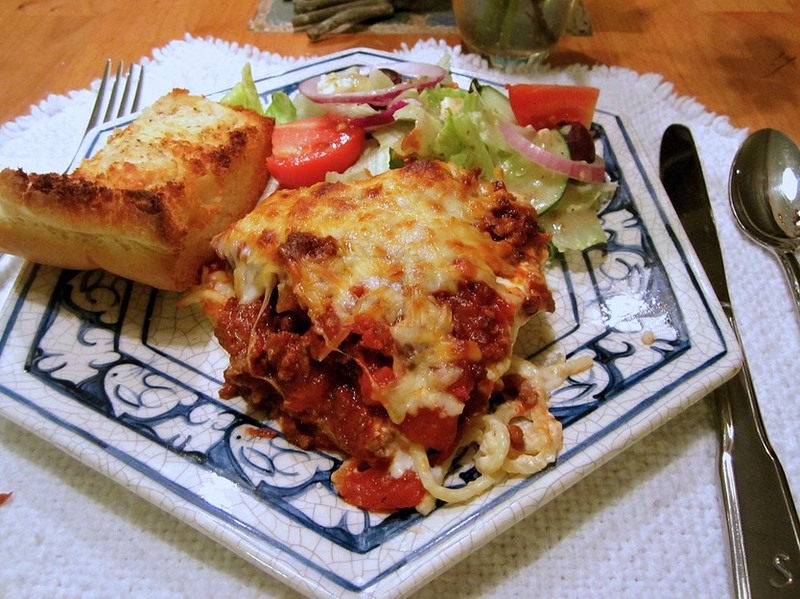 Bake for 25 to 30 minutes until cheese is browned and sauce is bubbly. Serve immediately to rave reviews!